Relay some of Lady Tanly’s story in an original piece of Lady Tanly-themed TERA artwork by Sunday, December 2 at 11:59 p.m. PST, and you could win a Lady Tanly bundle plus loads of EMP! You’ll also secure a spot for your artwork on one of our loading screens, with your character name and server name displayed below the image. 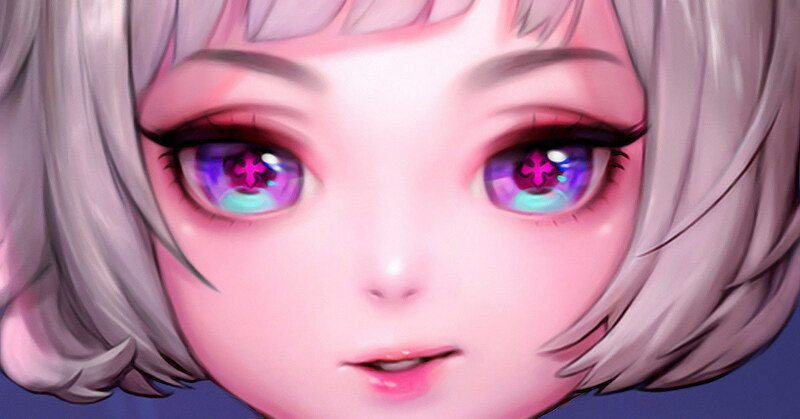 Need to know more about Lady Tanly, the first elin brawler? Get the whole story here! Or create an elin brawler of your own, and experience the story firsthand! Here's a quick guide on how to make your very own Lady Tanly! Watch for social updates every day on Twitter and Facebook until Friday, November 30, for inspiration from Lady Tanly’s herself! Submission must be original art (sorry, no screenshots) sized 1920 by 1200 pixels, 24bit RGB in .BMP, .JPG, .PNG, or .PSD format. Your full entry must be received by Sunday, December 2 at 11:59 p.m. PST. Standard EME contest rules apply. We’ll announce the winners (and honorable mentions) on our weekly Twitch stream on Tuesday, December 4. Honorable Mention: Fame and glory (plus a little extra)! If a picture paints a thousand words, why not tell Tanly’s story and win prizes? Hi there @Treacle I have the rules here! @Selenya I added reaper to the 2nd part of the vote links. Sorry for missing that! 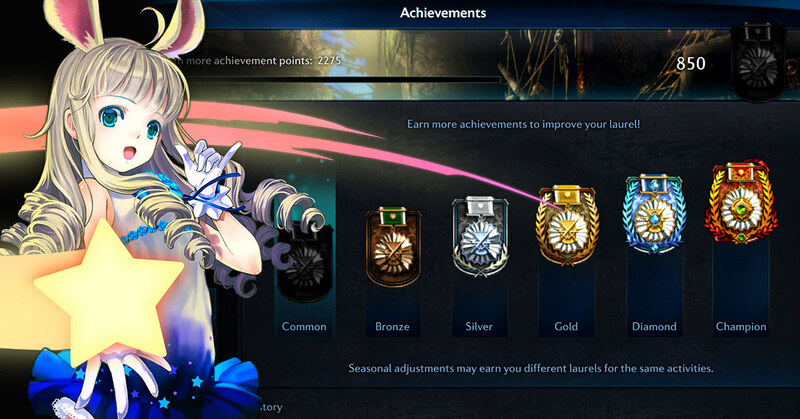 If you want to look just right for your brand new elin brawler, just copy these images here! If you want the outfit, powerfists, title, character slot, and appearance change voucher, grab yourself the lovely Lady Tanly Bundle HERE! Vote and pick which class we'll highlight next in December! Poll closes November 30th. Meet Lady Tanly. Once a handmaiden to Princess Rida, Tanly was present when orcan raiders attacked Pora Elinu, and was not only frightened by the ferocity of their attack but frustrated by the kingdom’s response. When Rida began summoning reapers from the Lake of Tears to fight the orcans, Tanly felt betrayed by Rida, and lost faith in the Princess’s leadership. Tanly vowed to find a way for elins to strike back without corrupting their divine spark and left the ruins of Pora Elinu in search of a new life. With no special powers or training, Tanly’s journey was difficult at first. But as time passed she discovered a talent for negotiation, and soon found steady work helping trade caravans arrange passage through contested areas. For one trip, Tanly hired the mysterious human woman Marda as a guard. Tanly was worried that Marda was not skilled enough to protect an entire caravan by herself, and the brawler’s assurance that “I’ve got everything I need strapped to my back,” didn’t do much to boost Tanly’s confidence. But on the second day of the trip, the sight of Marda facing off against an orcan raiding party and their trained basilisks was all the convincing Tanly needed. That night, Tanly snuck into Marda’s tent hoping to find the secret of the woman’s incredible power. Marda was waiting for her, and the two bonded over their past experiences with orcans. Marda explained how she drew strength from her childhood trauma when orcans attacked her village and killed her father. Marda then pulled a pair of battered and oft-repaired leather gloves from an equally maintained chest. Tanly leaned forward to examine the gloves and saw that the leather was infused with iron and chased with even more exotic metals. They were nothing like the ornate powerfists Marda had used to knock a basilisk on its back earlier in the day, but at the same time she knew they were more than just gloves. Tanly accepted the gift with shaking hands, barely able to contain her excitement. Slipping on the powerfist prototypes for the first time, she knew she’d made the right choice. “How do they work?” she asked, the words barely louder than a whisper. Added brawler as a selectable class for elin characters. Race Change Vouchers do not allow female human brawlers to become elin brawlers at this time. 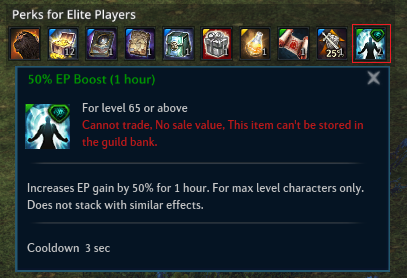 Use EP to boost base stats and skills. Gain EP by completing Vanguard Requests and defeating high level monsters. Unlock EP by reaching level 65 with at least one character on the server. EP XP is gained per server, and shared with all characters on that server. 100% EP XP Booster (1-hour) items will be given out for the next four weekends. Gain 2x boosters each day (Saturday and Sunday), for a total of 16x boosters throughout the event! One (1) free character slot per server (Kaiator and Velika) will be delivered via Parcel Post when you log in between Tuesday, November 13 and Tuesday, November 20. The likenesses of the season’s top-ranked Bahaar’s Sanctum party will be cast as statues for the following season. Likenesses are based on the character's appearance during maintenance at the end of the season. Some costume items may not be reflected in the cast image. Other rewards include Infinity Mask Ticket, Onset Mask Ticket, and Medal of Conflict. Players can now enchant Heroic Oath gear up to +3. Added Supreme Metal to General Goods merchants. 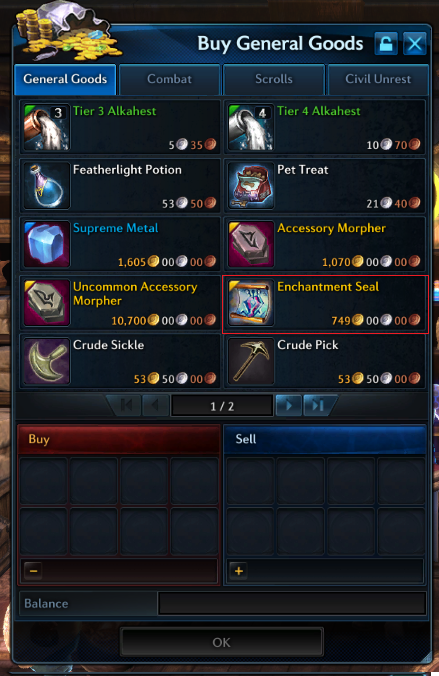 Increased item stack limit on various recovery potions, scrolls, and Equipment Crystals. Replaced Entropic Strongbox with Item XP Strongbox. Reverted Fashion Strongbox to pre-halloween contents. 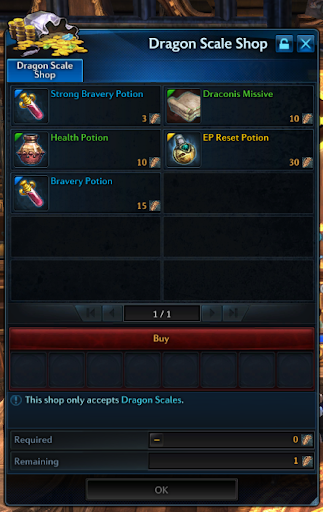 Added EP Reset Potion to Dragon Scale shop. Added Gym Uniform Renaming Coupon to Novelty merchants (change took effect with v75-HF2). Removed Xigncode from game client. Xigncode data folder may still exist in client directory [“...\Client\Binaries\XIGNCODE”]; this can safely be deleted. Added ability to hide visual effects created by other players. Today's stream is going to have the following stuff! - I'll do a dungeon run with Keanu and friends to show off more Apex Gunner goodness! Also I'd like to hear what YOU want to see next! Choose the next Apex stream here and we'll get the experts together to chat about the class! I'll close the poll November 30th. And as always, any feedback about the stream is always welcome. Join us at our channel here! Here's the forum post that explains it a little better. @Pwhoops thank you SO much for this! I'll share it with the support team to make sure we can cross-verify any cheaters. You da best! We're aware of the issues in Fraywind Canyone and Corsairs Stronghold. We're working on resolving this issue and detecting cheaters that are using this exploit. There is a process involved in detecting these cheaters as we want to catch as many people as possible while also minimizing false positives. If you feel that anyone is exploiting or cheating at anytime please contact the support team. I want to ask those that see any player cheat, please report any of that on our Customer Support page! Please and very much thank you!!! What does everyone think is the best way to avoid this sort of situation? Thanks for the feedback everyone! I'll try and do a better job of asking questions and adding comments in here. I promise I read these! It's an important part of my day. 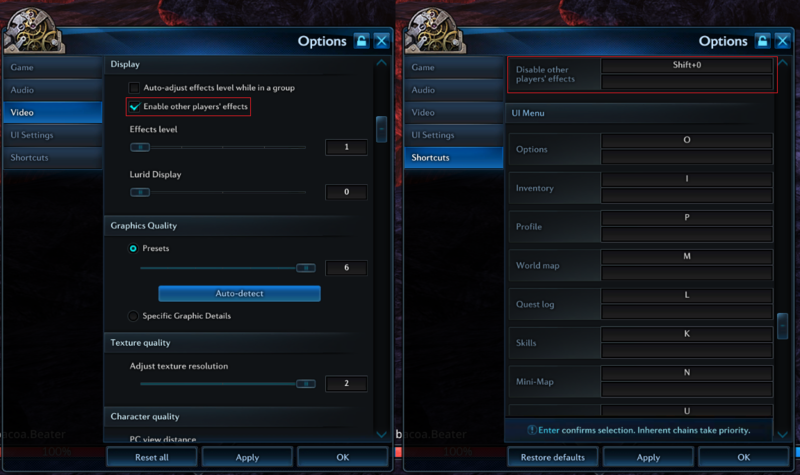 @UtterlyUseless What are your favorite parts about the current UI and the old UI? Thanks to those that watched the stream today. I learned a lot from doing this and I'm excited to keep moving forward with it! I look forward to what you all have to say! When it comes to negative feedback, it's something that takes more investigation than just one comment, and it tends to have a lot of different perspectives that I have to parse through. But when there's positive feedback, it's easier to pass that feedback along to Bluehole. It's good to combine feedback with positives and negatives. I commented on this thread because it was a straightforward thread. Please don't think that because I don't post on other threads, it doesn't mean I don't grab that feedback either. For example, I've grabbed feedback from the Kyra's posts, more feedback on UI, and how hard it is to be a level 65 player that isn't necessarily super well versed in those harder dungeons. Could you share a video as an example please? If this is an issue, I'd like to share it with Bluehole. @Chlorox the maintenance we're doing today is meant to fix that issue! I hope your passives are back up and running after 11 am today, please let us know if it doesn't! Added Instance Reset Scroll for ilvl 455 dungeons to the VG shop. Passive skills will now trigger as expected, such as Nether Dragon crit and Reaper’s Vengeful Attack. Minimap will no longer be locked. Supreme Metal has been added to the Metamorphic Emblem shop. Added Apex Skills to the remaining 6 classes: Sorcerer, Archer, Reaper, Gunner, Ninja, Valkyrie. Requires starting Velika Banquet, part of The Two Banquets questline, at ilvl 439. Adjusted Recommended Glyphs and Chain Skills leading to Apex skills. See our Dark Reaches promo page (http://tera.enmasse.com/events/dark-reaches) for a quick rundown of the new skills! Accessed via Instance matching or the teleportal in Plaza of the Mighty in Colossal Ruins (Val Aureum). Requires ilvl 446 for instance matching. Limited to 1 entry (2 for Elite) per day. 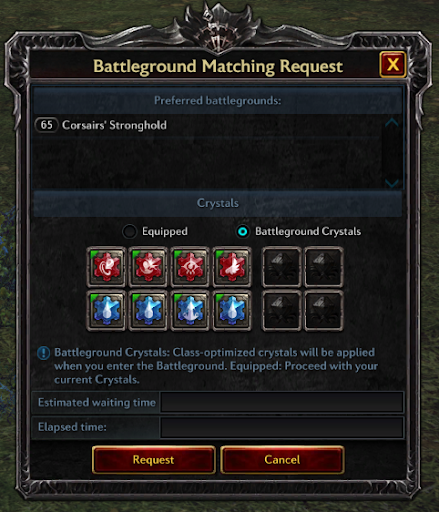 Requires ilvl 453 for instance matching. Accessed via Instance Matching or the teleportal between Plaza of the Fallen and Nightwood in Darkquaver Woods (Sylvanoth). Requires ilvl 455 for instance matching. Requires ilvl 412 for instance matching. Limited to 2 entries (4 for Elite) per day. Requires ilvl 431 for instance matching. Added Grotto of Lost Souls (hard). Increased Infinity Mask drop rate by 50 percent. Added Accessory Amplifier (Tier I) to drop table. Increased Onset Mask drop rate by 50 percent. When a Newcomer completes an eligible dungeon with a Veteran player, the Newcomer can compliment the Veteran player via the Compliment UI. 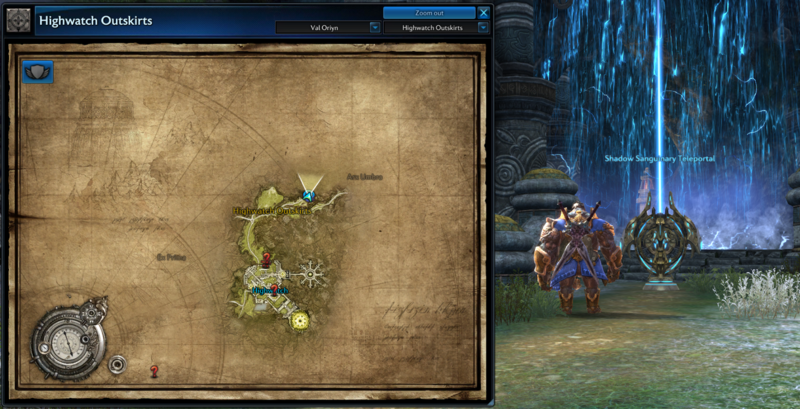 and joined the dungeon via Solo Instance Matching. Complimented Veteran players earn Veteran Guardian Tokens and other materials. 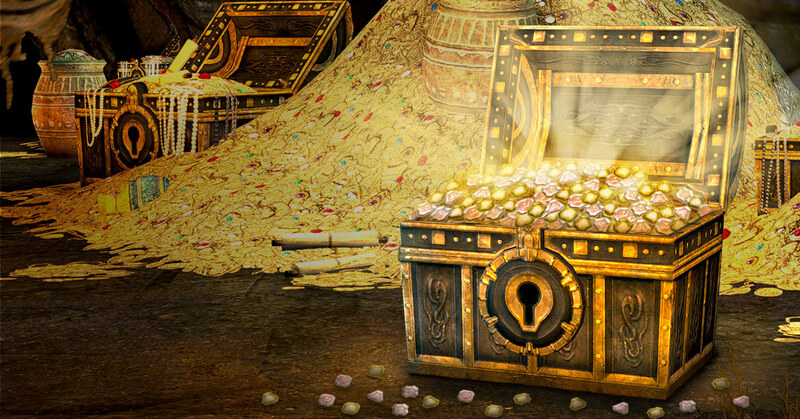 Veteran Guardian Tokens are used to purchase Veteran Guardian Crates, containing Golden and Silver Talents. 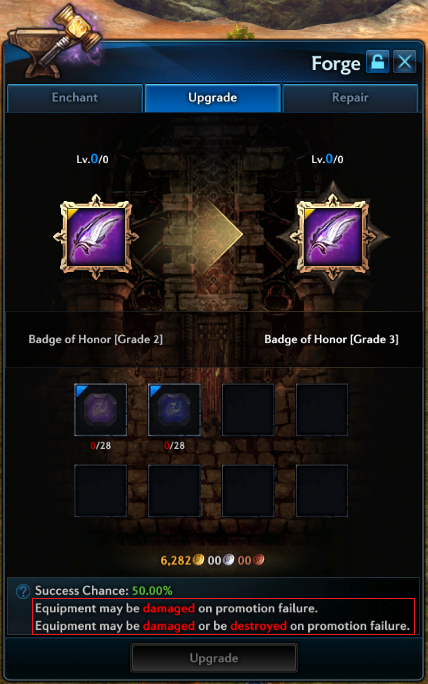 NOTE: Eligible Dungeons and Rewards may change in future updates. Acquired from Grotto of Lost Souls (hard) or by upgrading an Infinity Mask. 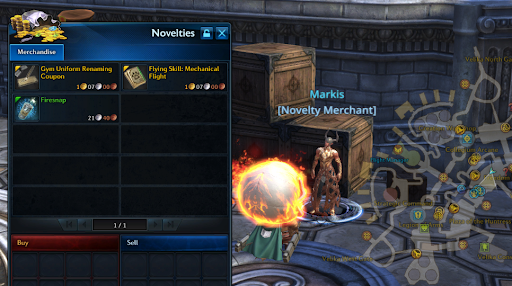 Players can dismantle Onset, Infinity, and Transcendent Masks for Exchange Coupons. Exchange coupons can be used to purchase any mask within the same tier, or an Upgrade Stone for a lower tier mask. Players can now enchant Heroic Oath gear up to +2. Change a Power accessory to a Crit accessory, or vice versa. Can be purchased from General Merchants. Accessory Morpher works for Prospect, Bellum, Daylight accessories. Uncommon Accessory Morpher works for Entropy, Ethereal accessories. Amplifier tier I upgrades a belt or accessory to tier I.
Amplifier tier II upgrades a belt or accessory directly to tier II. Amplifiers dismantle into Amplifier Tokens, which can be exchanged for an amplifier of your choice. Total possible number of achievement points has increased to over 17,000. Laurel requirements have been rebalanced to match. Moved several achievements to the Special tab. Changed HP/MP gauge and skill slot design. Changed class-specific gauge UI design. Changed system menu icon design and location. Changed chat UI and system message design. Added weapon effects on/off toggle in Video Options. Reaper’s passive skill Vengeful Attack does not trigger as it should. Instance Reset Scroll for ilvl 455 is nonfunctional and will therefore not be available for purchase. Civil Unrest BAMs may not spawn as expected. Following yesterday’s statement, we have received a lot of questions regarding the ongoing use of proxy relative to our terms of service. We are not actively seeking out players who use proxy and other third-party mods to improve their gameplay experience. 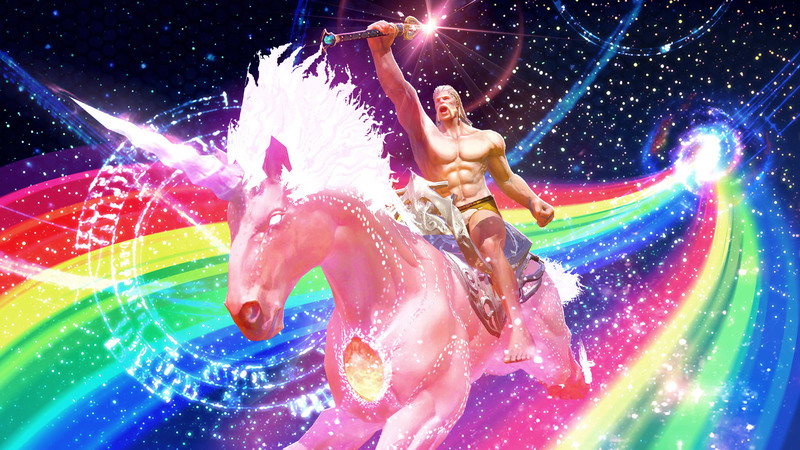 Ultimately, we want you to enjoy playing TERA fairly. Monitoring streams to identify players who are using DPS meters or UI mods to ban them is not a regular part of our day-to-day. That said, we remain committed to addressing reports of cheating and abuse facilitated by third-party programs. Using third-party mods remains in violation of our Terms Of Service, and we reserve the right to ban any player purely for their use of ANY unofficial mod, particularly if we deem such use to be abusive or result in any kind of unfair play. If you choose to use third-party programs, you do so at the risk of your En Masse account being banned. We remain dedicated to pursuing long-term and official solutions to the beneficial features provided by popular third-party mods to eliminate this grey area in the future and provide an improved experience for our players (as outlined in yesterday’s message). The Lustrous Federation Crate is bursting with one of six talent packages - in store until October 15 @ 10 am PDT! It’s been a little over two weeks since our TERA Proxy DMCA requests were executed by Discord and GitHub. We have seen the frustration and worry this has raised among members of our community and we understand the reasons behind them. 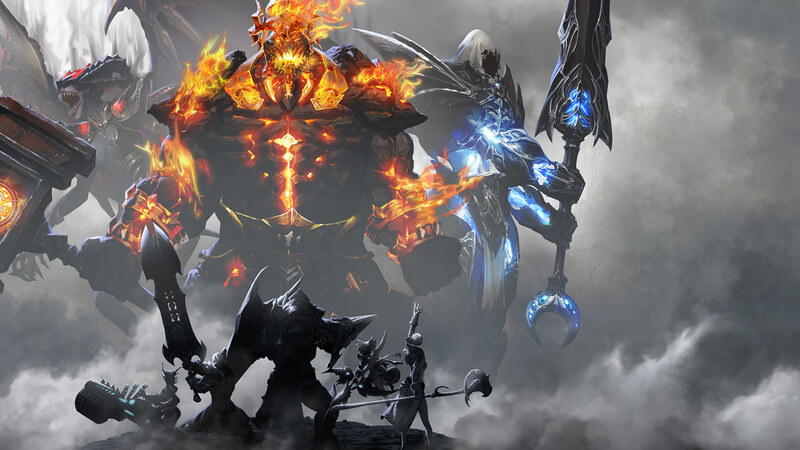 TERA Proxy has existed for some years as a controversial platform for modding TERA. It has been used to build or support some tools into the game that players have come to rely on; like a DPS meter, some UI and some optimizations that reduced ping and lag. For some players, these optimizations have become vital. Unfortunately though, some players have also used these tools selfishly for cheating or griefing. 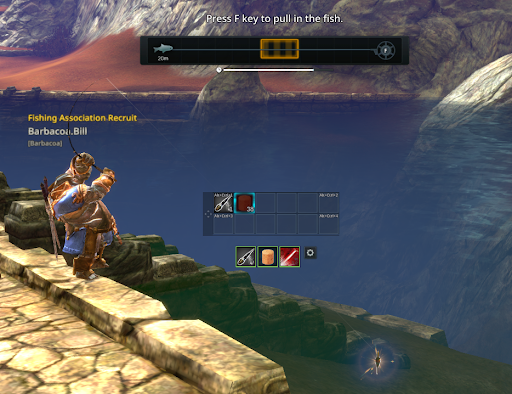 Those players for whom Proxy has contributed to their enjoyment of TERA are understandably upset. The Community Team here is sympathetic to their position (though not necessarily with all of the ways they've chosen to express their frustration) and we are actively communicating with Bluehole to identify solutions to underlying problems that Proxy solved for these players. The TERA community has felt unheard and under-served for some time now. Many of you may feel numb to messages and community addresses that come off like platitudes. The current Community Team at En Masse is well aware of this situation and taking lengths to remedy this over time and in response to this specific situation. Community feedback we’ve received following the takedowns has made it clear that the players want certain features these third-party tools provided and we feel it’s our duty to provide a solution. To start, we’re working directly with veteran players and long-time members of EME staff to ensure we properly contextualize all of the feedback that we are passing along to the developers in order to avoid past pitfalls and process traps. So far, this has been well-received. Bluehole is responding to us with higher urgency and at a higher level than in the past; there is an active and shared interest between EME and Bluehole to find solutions for an in-game DPS meter and UI optimizations. EME is devoted to investing our own resources into building out these solutions as well. It is still early days, but we are working on reallocating internal resources, reaching out to talent outside of our organization, investigating ways to enable, empower the existing mod community to find and build their own secure and sanctioned solutions. In short, we’re actively exploring any and all avenues to address ALL of your feedback (Proxy-related or otherwise) in a more agile, creative, and transparent manner. Meanwhile, we’re working to improve our relationship with the community following these takedowns by more openly communicating our progress towards providing meaningful replacement solutions and fostering a collaborative spirit surrounding their development. We hope this can be a rallying moment in TERA’s history where we can all come together to build a brighter future for Arborea. We're giving you a Mount Token to replace your Go-Kart mount, as it's no longer available in this region and has to be removed. How are we going to give them to you? 1. You'll receive a parcel post from SingleBear after maintenance October 9 (after maintenance) containing the appropriate number of tokens per mount. 2. Tokens are delivered to the last character logged in. 3. Tokens are compensation for the removal of the permanent Temporary Skill Books and permanent learned mounts. Temporary learned mounts will not be removed and will be allowed to run out their duration. No compensation is provided for learned temporary mounts. Thanks for understanding, and sorry for the inconvenience! As of the start of Season 8, the current number of eligible achievement points is 15025. If some of your unlocked achievements were moved to “Legacy” status, you may need to complete new achievements to regain your previous Laurel. To earn a Bronze Laurel, a character needs 20% or more of the available points (around 3005). To earn a Silver Laurel, a character needs 40% or more of the available points (around 6010). To earn a Gold Laurel, a character needs 60% or more of the available points (around 9015). To earn a Diamond Laurel, a character needs 80% or more of the available points (around 12020). To earn a Champion Laurel, a character needs 95% or more of the available points (around 14275). NOTE: Laurel calculations are based on an internal percentage, and due to rounding issues may not correspond exactly to the numbers shown for each tier. In some cases, the game may show 0% remaining to reach a new tier when you really have 0.4% or less. When this happens, unlocking one more achievement should suffice to award the Laurel. 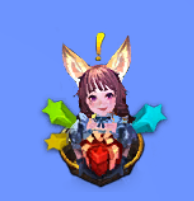 Have you spotted this little Elin on your screen? She may have some fun tasks for you to do for some great rewards! You can find details in the in-game calendar. The TERA PC team is working on something to share by early next week. Per Denommenator's forum post (also quoted at the start of this thread), we ask for your patience. We want to be sure that we provide you meaningful updates, so this post is to serve for the purpose to let you know we are not ignoring you. We have certainly heard you on "we don't want to just be told we are being heard, we want action". That's fair. But it also takes a little bit of time. Right now, we are working with Bluehole to determine what we can implement alongside our current roadmap. We want to share with you more than a "yes, we'll do XYZ", but a "yes, we'll do XYZ, here is when". I know it's hard when you can't see the work we are doing, that you only have what communication we do here or on the Discord to rely on. Like Denommenator's post said, we do hear you, and ask for patience while we work through your feedback and with Bluehole. We'll be providing another response by early next week. Sorry for the delay on this one. We want to let you know that moving forward we're going to change how we announce/communicate the monthly in-game events to you. We want to make sure the events are able to be found by players while...well PLAYING the game! The best place to find information for these moving forward in the in-game calendar. - We're a couple weeks away from Dark Reaches and the final round of Apex skills. Look for events to help you level and gear. - Harrowhold Bonus Loot will be turned on Tuesday, October 2 at 4 am PDT (11 UTC). These loots will be placed as Event Bonus loot and subject to change from time to time. See in-game calendar for more details. - Dreadspire will return Tuesday, October 16 with v75 Dark Reaches release. Loot details to come! - With the addition of the Bellicarium shop in v74 we will now be able to run events to increase Bellicarium Credit rewards. With the release of v75 Dark Reaches, we will be removing the Jackpot from Battlegrounds which was acting as a temporary system to reward player efforts in Battlegrounds. Elemental Essence will also be removed from the BG Coin shop as it is included in the Bellicarium shop. BG coins will continue to be available through BG Vanguard Requests. - Guardian Legion and Guild events will be dropped from the weekly cycle. These events will come back for special occasions. Don't forget! From now on, check the in-game calendar panel for upcoming events! This is the thread from the News & Announcements area. Please be kind, respectful and if you want to add constructive feedback, it's welcome. Disciplinary action will be taken if any player uses foul language, attacks EME employees or other players. I am REALLY REALLY REALLY sorry, this is not a good excuse, but with PAX/server merges my plate was overflowing. I just emailed everyone, and all of the winners should be receiving their rewards by the end of the week. This is seriously my bad. I'll make sure the next art contest we do it so much better on my end. @Pee please let me know if you get that email!!! With maintenance on Tuesday, September 25, we will be reverting the character deletion rules back to a 24 hour deletion state for level 40 and above, instant delete for characters 1-39. Make sure any characters level 1-39 that are currently in a deletion state are characters you want deleted. If you do not want them deleted, you need to cancel the deletion state prior to maintenance (September 25 at 8 AM PDT). When the servers come back up, any characters that are left in the deleted state, or if you try to delete a character that's level 1-39 will be immediately deleted. We seem to be having issues with Civil Unrest (CU:Velika). Our backend had a timing issue, which threw Civil Unrest out of whack. We are aware of the issue and working out all the parts it may have impacted. As of now, we want to make sure you know what we know, and will let you know any updates. 1. 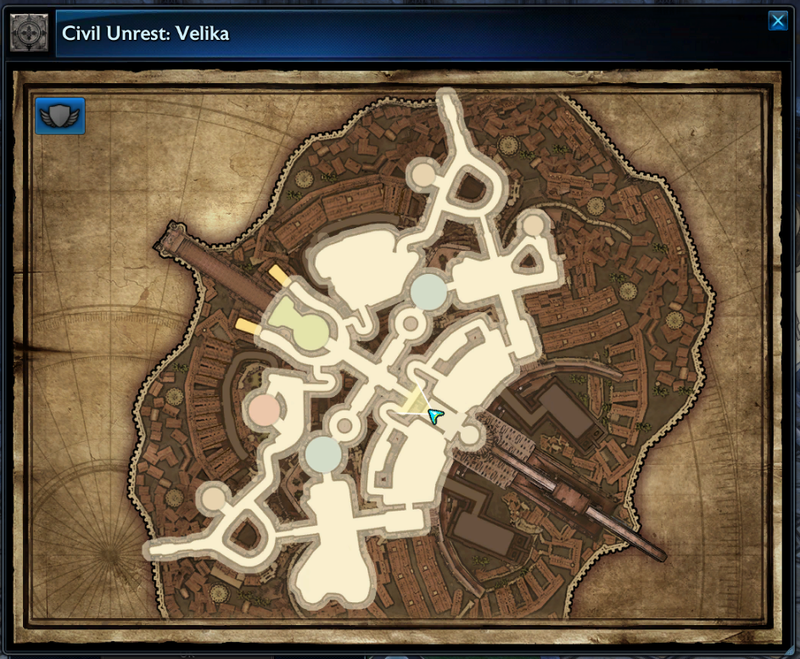 CU:Velika occurred at noon. According to our server datasheets, CU:Velika should occur at 1 pm PDT. We do not know why it has been occurring at 6pm PDT. We expect CU:Velika to occur next Saturday, September 29 at 1 pm. 2. Vanguard Request UI fails to list missions from 4 - 5 pm PDT. We believe this is due to the world servers being incorrectly set to GMT and dungeon servers being correctly set to UTC. Players that enter dungeon between 4 and 5 pm PDT appear to be the ones encountering this issue so we believe it is this server time desync that is causing the issue. This should be resolved on Tuesday during maintenance when world servers will be set to UTC. - Despite the above timezone discrepancy, it seems that CU:V triggered six hours earlier than expected, rather than being one hour off as the issue would suggest. We are investigating this issue. 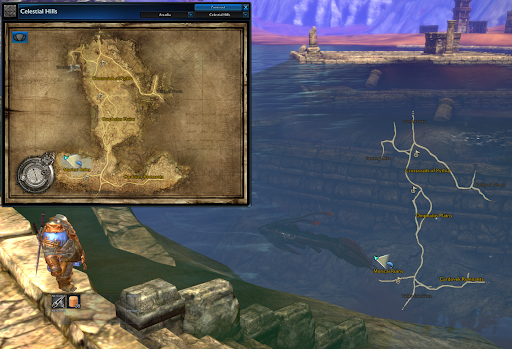 - Between 4 and 5 pm PDT, players in dungeons did see their Vanguard Requests, while players in the open world did not. - The time change appears to require a server restart to take effect. - There is a possibility of continued triggering 1 hour early until Tuesday maintenance, while others may be fixed as of 12:10 pm PDT today when our Operations Team fixed the server time. - We are assuming that all systems may be +1 hour off due to the server time setting. 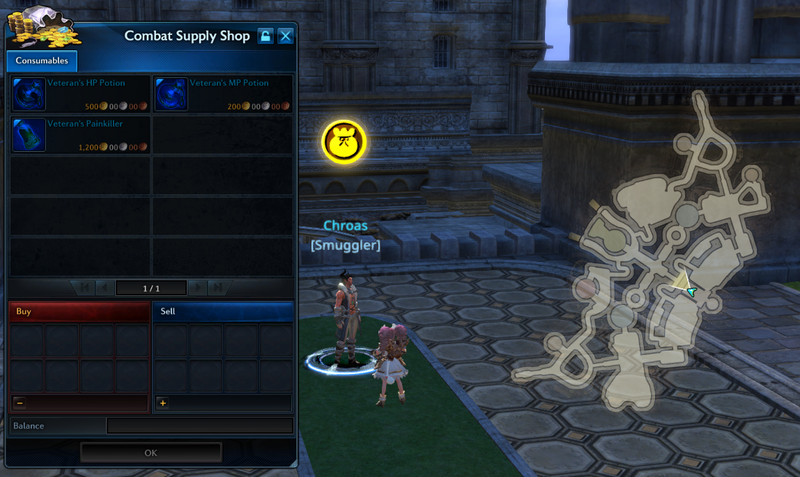 - The CU:Velika issue of towers being placed in previously restricted areas is a mystery. I can’t see how it is related to server times. This is not a new build or datasheets. Could be a time issue but it doesn’t make sense to me yet. We’ll make sure to update you all on these and other remaining known post-server merger issues. Starting Thursday, September 20 at 11 a.m. and continuing until Thursday, October 11 at 11 a.m. PDT, Shadow Sanguinary and Shadow Sanguinary (Hard) Vanguard Requests have token rewards that can be used to purchase various items. Master Blacksmith's Hammer: Used to refine Superior Brooches, drastically reducing the material requirement and gold cost to upgrade them. Pink and Blonde Afros (7-day): Turn heads, and keep them turned, with these novelty wigs in two different colors! Shadow Sanguinary requests award one token, and Shadow Sanguinary (Hard) requests award two. You can earn a maximum of three tokens per day by completing Vanguard Requests, no matter how often you complete the indicated dungeon. Don't delay! 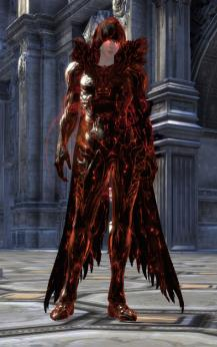 The Shadow Sanguinary highlight event ends on October 11. It's autumn everyone, and you know that that means! That's right!!! Rootstock and Pond Faire have begun~ Starting Wednesday, September 19, until Thursday, November 1. 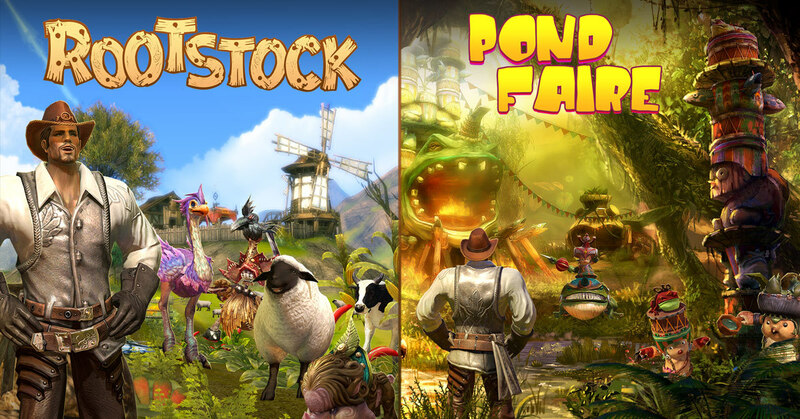 During these festivals, you'll learn to make a variety of potent consumable dishes that provide combat boosts, complete achievements, earn cool pets (like Pinkie, Rainie, or Rusty), or possibly even acquire the elusive Moonsilk Carpet mount. Visit any Festival Guide for a teleport to the festival grounds. I'm a sucker for clever abbreviations. Welcome to your new server homes! Moving is hard! We wanted to thank you for bearing with this server merge, and wanted to give you some nice autumn-themed gifts to make your new spot nice and cozy! You'll receive these gifts from us between Sept. 18 2:45 PM PDT - Sept. 25 11:59 PM PDT when you log into the game! With these new servers, there's a chance that things may not be exactly the same, or there may go awry. We're opening up this forum thread to share any issues so we can share them with Bluehole and our Support team. - Dreadspire is off, we will announce it's reopening soon with adjusted bonus loot tables. - Fashion shop is still being set up. We have gotten enough questions about character renames and the server merge that we felt a clarification of the process might be helpful. We feel that overall play time is the fairest way to determine who gets to keep any given character name. After all, if you’ve put in a lot of work on your character “Fluffy.Bunny,” and someone else created their own “Fluffy.Bunny”—maybe in an attempt to “camp” the name—it wouldn’t be fair to you to give that player the name just because they logged in more recently. I wrote in the other forum post pointing to this one. I've shared this with Bluehole! However, if anyone is having this issue, I really hope you're sending in support tickets and sharing your issues so we can fix this! I'm going to share this with Bluehole, however, if anyone is having this issue, I really hope you're sending in support tickets and sharing your issues so we can fix this! Just to clarify, the expiration means that you won't be receiving FREE character slots once maintenance starts. If you've logged in and received them, then you're fine. @TFMK3JDWE3 Here's the FAQ in case you have any other questions! 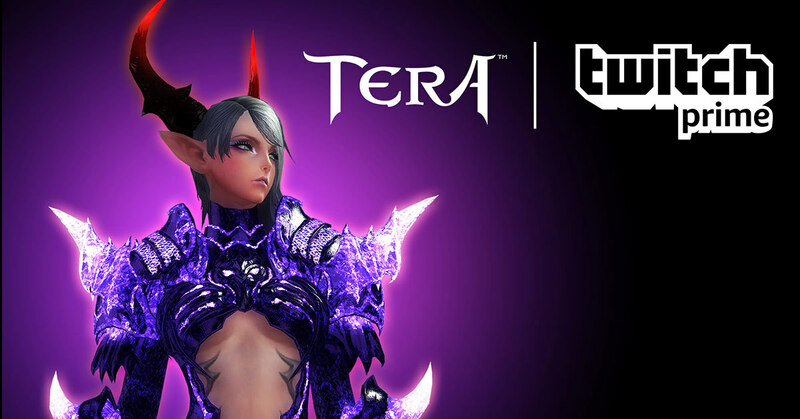 The TERA PC server merge happens Tuesday, September 18. To get you ready for the big day, follow these steps to make your post-merge life much smoother. Claim eight (8) Additional Character Slots from Item Claim between Tuesday, September 12 and TBD on exact time when window will close (update will come tomorrow Sept 13). 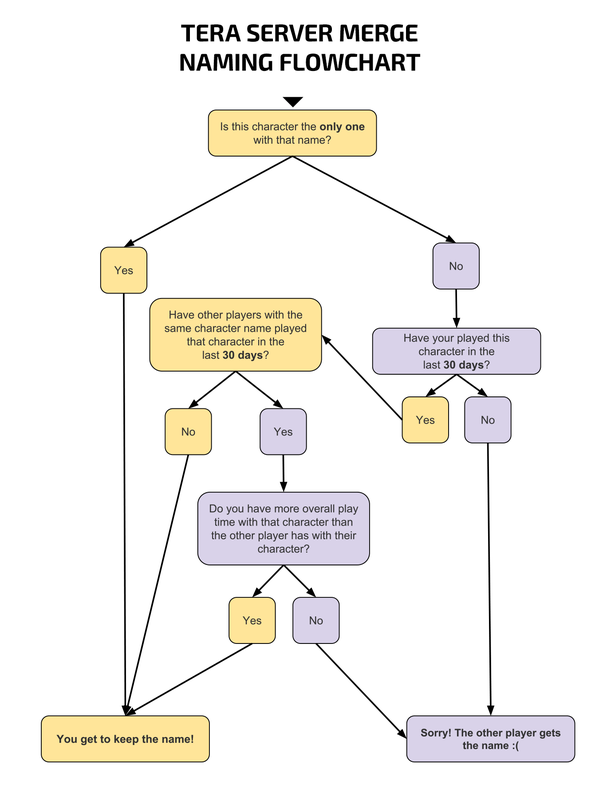 Apply your Additional Character Slots to the server where you have the most characters, to accommodate your characters from other servers. We highly recommend that you increase your available character slots on one of the merging servers as close to the maximum of 20 as you can. If you are uncertain of how many slots you have, take a few minutes to create level 1 characters until you hit your server’s limit, note how many Additional Character Slots to use on that server, then delete the new characters. Identify characters on any server that you no longer play or don’t need, save any important non-bound items and gold they might have, then delete them until the total number of active characters remaining on that server type (PvP or PvE) is equal to or less than your total available character slots you now have. You should try to avoid deleting any character you have spent money to outfit, level, or costume. If you know you have a deleted character that you wish to keep, put in a support ticket immediately. Characters deleted prior to the merge cannot be restored following the merge. Confirm that any guild you are a part of has more than two members. If a guild drops below two members for any reason—such as characters being removed during the merge—the guild will disband. 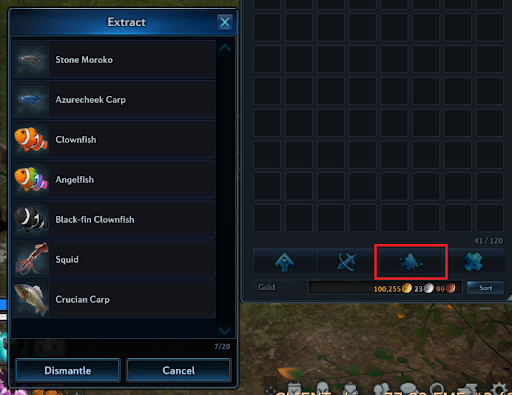 Retrieve any items you have listed with the Trade Broker. 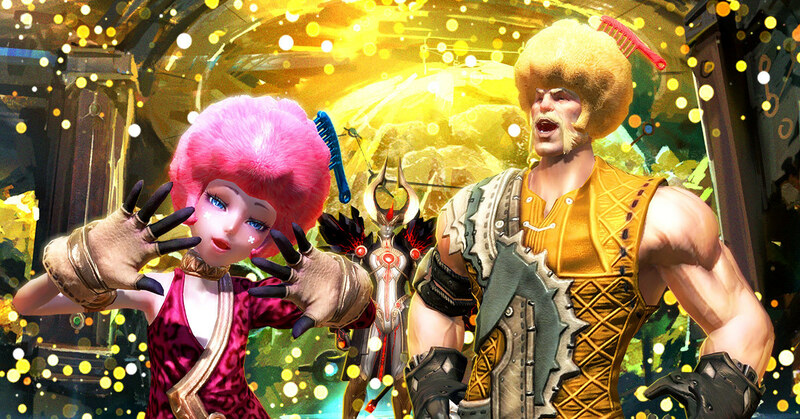 Remember, the TERA PC server merge takes place on Tuesday, September 18—so make sure to complete these steps before then! Decreased total casting time by 2 seconds, and increased casting speed by 10 percent. Increased MP regeneration from 100 to 500 MP per second. Decreased duration from 20 seconds to 10 seconds. Increased cooldown from 10 seconds to 20 seconds. Changed cooldown from 120 seconds to 90 seconds. Changed attack speed increase from 5 to 4 percent. Decreased PVP damage by 5 percent. Requires ilvl 439 for instance matching, and 1 entry (2 for Elite) per day. Accessed via teleportal in Highwatch Outskirts. An event will begin post-server-merge to earn Tokens which can be used to purchase Master Blacksmith’s Hammer and other useful items. These tokens will be removed from inventory during our next major release maintenance in October. Watch our socials for details! Rebalanced high-level dungeon rewards to include Heroic Oath Gear and Ethereal Accessory enhancement materials. Increased Bellicarium credit cap to 2,000,000 credits. Removed Killing Spree and its credit merchant. Added Onset Masks to Gridiron Medal Shop. Added quests to the Two Banquets questline. All characters ilvl 428 and above can begin the pre-banquet quests in Highwatch. Each subsequent quest requires a higher ilvl, topping out at ilvl 438. Additional quest unlocked for Apexed players who have completed One More Time. We wanted to let you all know as soon as the decision was made that the final verdict is that Celestial Hills will be merged with the other PVE servers. 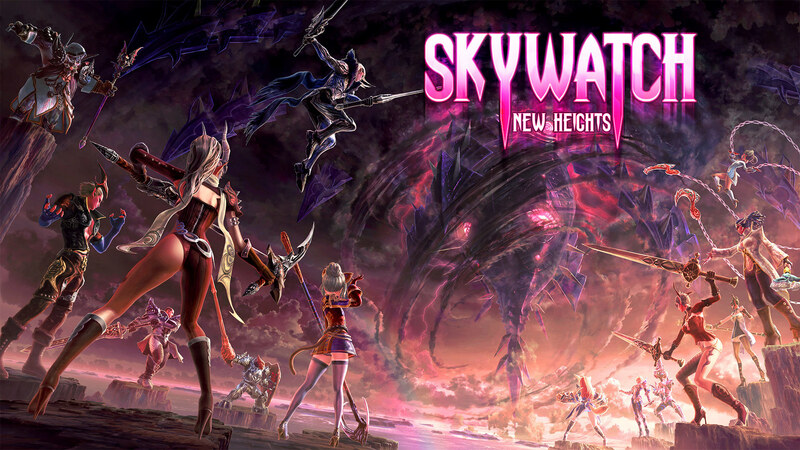 We will have an official News Post going out tomorrow morning (as previously posted) with details on how to receive your 8 character slots and stating that Celestial Hills will be added to the server merge. Thank you all so much for your feedback. "Do we keep spots saved in travel journal?" - Yes, those locations remain saved on the new Server. "Do you lose your friends/friendship-bonds when you transfer?" - Existing friends and friendship-bonds will remain, however please note that both friends and friendship-bonds can be effected by players needing to delete a character, in order to stay under their Account's Character Slot maximum on the merged server. "If an entire guild is transferring and CH ends up not getting merged, are we getting screwed out of our guild level"
- If the players on CH leave their Guild and utilize the free Server Transfers, there would not be a way to keep the existing Guild Level of the CH Guild on the other Server these players choose to move to. I'll make sure to update the banner every time we're live so people can tune in!